I always get nervous when I look at the scholarship reports for my class. No one at my school is silly enough to say so, of course, but it's easy to feel like the pass/fail rates say something profound about you as a teacher. 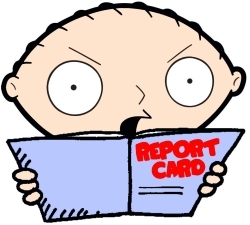 No more than the old Teacher Data Reports, of course, do the scholarship reports mean. They're one piece of information in a sea of information about what you do as a teacher and what happens in your classroom. But as we begin to look at the information, identify the at-risk students, and brainstorm what we can do for them, I have this awful feeling, because I looped with my students from last year, that I've played this particular game before and already know the outcome. The at-risk students this year are the same at-risk students as last year. They're almost across-the-board kids with emotional issues, behavior problems, poor attendance patterns, or some combination of all three. We can argue about the root causes all day, but the core of the problem, for me, is that these students, by and large, don't come to school and, when they do, they don't do any work. I'm sure there are root causes, about which I am sympathetic. But there is little I can do with a student who comes to my class twice a week, never comes to tutoring, and sleeps, doodles, or chats when s/he is there. It's much more fulfilling for me to spend time on the 90% of my students who show up consistently, try hard, and generally don't present themselves as a puzzle for me to solve. So when I see the scholarship report, I have to tell myself, as always, that that ugly failure rate is a combination of many factors, only one of which is me and my class. And I can do everything I can to make that factor the best and most helpful it can possibly be. But until those 10% or so start coming to school, putting in the effort, and putting down the iPhones and the Modern Warfare 3 on their off-hours, I'm limited in what I can do. And that's a piece of information a scholarship report will never give any of us. We have to keep telling ourselves that.